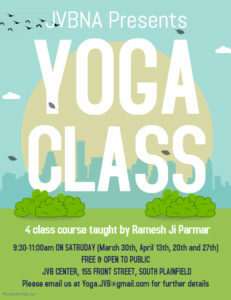 JVBNA-NJ (Center for peace and preksha meditation) is organizing a 4 class course on Yoga in South Plainfield, NJ. The classes will be conducted by Ramesh Ji Parmar – a trained yoga practitioner and instructor. The classes will be held every Saturday for the next 4 weeks from 9:30 am to 11:00 am in the morning. There is no fee to attend the classes, however, we expect that if you are interested you will attend all the sessions. The objective of the class is to teach all the important yoga asanas and to make sure that you are able to do the yoga exercises correctly. Regular practice of yoga helps not only have a healthy body but a healthy mind as well.